Looking for a place to have your wedding? 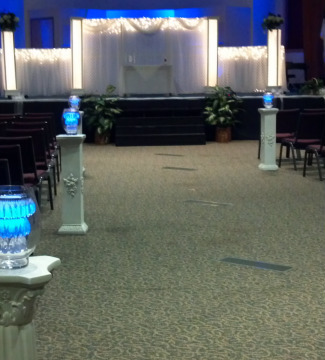 Looking for a pastor to officiate your ceremony? See what Crossroad Christian Church has to offer. Our sanctuary can hold up to 500 people. If smaller and more intimate is what you are looking for we have a multipurpose room that can accommodate 5 to 75 people. We have decorations available for a modest rental fee. We have a wedding coordinator who will work with you to make sure all contracts and details are in order including logistical staffing, meetings, decorating, music, rehearsals and customizing of your ceremony to fit your needs and desires as best possible. Our goal is to make sure your wedding day is as special and unique as you are. The complete cost for a wedding is $750.00. Included in the cost: The Pastor to officiate your ceremony, a meeting ahead of time to get aquainted with the pastor and share questions or concerns, the rehearsal, use of the sanctuary, foyers, restrooms, cry rooms and a bridal dressing room, the coordinator along with associated meetings, a sound and light technician, and custodian. You may provide your own officiate if you so desire. We require half of the payment ($375.00) and a signed contract to hold the date on our calendar. The remaining balance ($375.00) is due no later than 30 days prior to the wedding. In the event of a cancellation there is a $200.00 non-refundable amount. Included in the cost: initial meeting, rehearsal and ceremony.